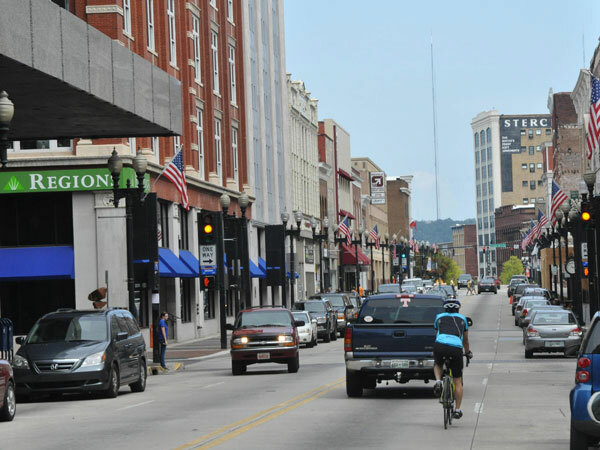 Since its development in the 1790s, Gay Street has been the center stage of downtown Knoxville's progression from a commercial wholesaling capital following the Industrial Revolution to today's vibrant entertainment and residential corridor. Through the hard work of countless individuals, organizations, and local governments, and more than $50 million spent on redevelopment projects since 2000, Gay Street has experienced a complete transformation from its ghost town atmosphere of the 1970s. Ten blocks between West Jackson Avenue and the southern end of the Gay Street Bridge. 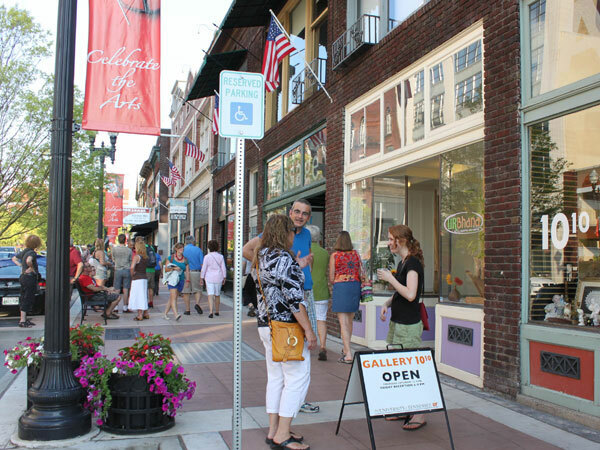 First Friday is a monthly art event beginning in the 100 block of South Gay Street and stretching to Market Square, offering visitors live performances, local food, and late night gallery shows, celebrating the vibrancy of downtown Knoxville. Photo courtesy Knoxville-Knox County Metropolitan Planning Commission. The most well-known firm headquartered along the street was the Sterchi Brothers Furniture Company, which occupied a number of buildings on the street but eventually settled at 116 South Gay St. in 1925. Company leader James Sterchi transformed the one-store business into one of the world's largest furniture companies at the time. The presence of wholesaling giant Cowan, McClung and Company, the furniture corporation W. W. Woodruff and Company, and Miller's Department Store solidified Gay Street as the city's business center in the early 20th century. With development of suburban malls during the 1970s, business dwindled to the point that many companies were forced to either relocate or close, leaving a surplus of vacant buildings along Gay Street. In an effort to save the historic Bijou Theatre, a group of concerned citizens formed Knox Heritage in 1974 to educate the city on the merits of preservation. Their hard work paid off when the Southern Terminal and Warehouse Historic District and the Gay Street Commercial Historic District were added to the National Register of Historic Places in 1985 and 1986, respectively. 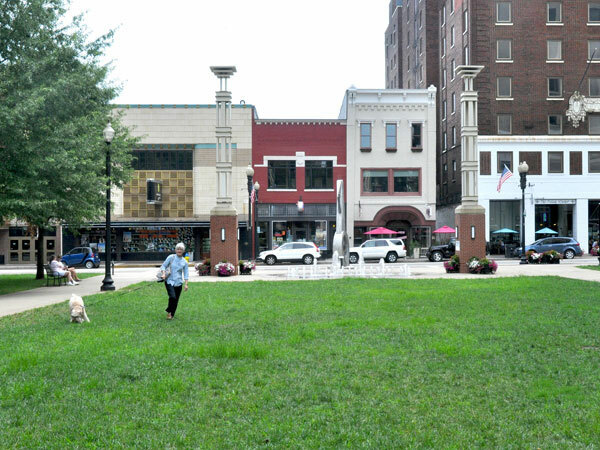 The City of Knoxville responded by adopting the Downtown Knoxville Plan in 1987 and the Downtown Streetscape Plan in 1988, both of which resulted in improvements to Gay Street including wider sidewalks, bicycle racks, landscaping, and historic lamp posts. In 2001, under Mayor Victor Ashe, the city began offering redevelopment incentives, including tax abatements, low-interest loans, and reduced permit fees, which spurred the renovation of virtually every historic building along Gay Street into residential, commercial, or retail spaces. Restorations of the Bijou Theatre and Tennessee Theatre, which have hosted performances by Bob Dylan, Diana Ross, and Johnny Cash, are two of the many projects that have helped Gay Street weather the 2008 economic recession. An influx of new shopping, dining, and entertainment options, coupled with the nearly 600 permanent residents, once more make Gay Street Knoxville's busiest street. Krutch Park features picnic tables and a relaxing water feature and is a favorite of residents who use it throughout the work day for a much needed respite from the hustle of South Gay Street. Photo courtesy Knoxville-Knox County Metropolitan Planning Commission. In 1987, the Downtown Knoxville Plan resulted in widened sidewalks, bicycle route designation, and three trolley routes down South Gay Street. Photo courtesy Knoxville-Knox County Metropolitan Planning Commission.